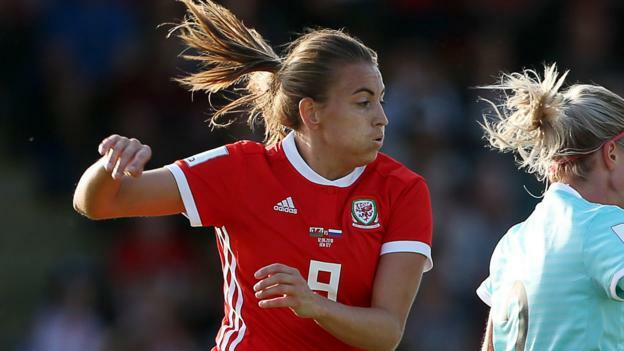 Kayleigh Green’s double and a Tash Harding strike earned Wales victory over Russia and pushed them closer to qualification to the Women’s World Cup. Three second-half goals at Newport’s Spytty Park – including a brilliantly worked second from Green – moved Wales one point above England in Group 1. Green broke the deadlock three minutes after the break before superbly finishing again 14 minutes later. Harding sealed the result with 22 minutes remaining. Wales host England in their final fixture on 31 August, and victory would guarantee them a place in next summer’s finals in France. Green’s goal against Bosnia-Herzegovina five days earlier had kept the dreams of Jayne Ludlow’s team alive, Wales having never before reached the finals of a major women’s tournament. Regardless of what happens against England, they are now assured second-place in the table and their best World Cup qualifying campaign. Only the four best runners up from the seven groups qualify for the play-offs, though that will not be on Welsh minds after they continued their 100% home record. Ludlow’s side were again forced to wait for this latest impressive result, however, as they had to deal with the physical threat of a Russian side seeded second in the group. Star player Jess Fishlock, in particular, was on the receiving end of several heavy challenges. Helen Ward, Harding and the impressive Rachel Rowe all had chances to open, while Wales were denied two first-half penalty shouts for handball as they gradually asserted their authority. They made their quality count when Rowe’s 48th minute cross was finished from a tight angle by Green after Harding’s effort was blocked. Green scored her fourth of the campaign as she chipped past Elvira Todua following a one-two with strike partner Ward on 62 minutes. And six minutes later Harding started the celebrations among the sell-out crowd – and the countdown to the decider with England – when she slammed home Green’s 68th pass at the second attempt. It made a mockery of questions over Wales’ goal threat having only scored four from their six games prior to this fixture. Their impressive campaign under former Arsenal midfielder Ludlow had been built on defensive foundations. Again the wing-back system impressed and earned a seventh clean sheet; the Netherlands are the only other side in Europe yet to concede in the campaign. Both aspects of Wales’ game will be put to the test against England, ranked second in the world but who have already been shocked by Ludlow’s team after April’s 0-0 draw in Southampton. There will be plenty of interest as to where Wales will face Phil Neville’s side. Having played at Swansea’s Liberty Stadium and the Cardiff City Stadium in this campaign, lack of availability saw Wales take on Russia at Spytty Park, the former home of Newport County. Though a reduced capacity, the sell-out 1,200 crowd still continued the buzz around the team while Ludlow had dismissed concerns over the surface before the game, insisting it was far superior than some of the “horrendous” pitches Wales Women have played on in the past. The venue for the clash with the Lionesses is still to be confirmed, although FAW chief executive Jonathan Ford has spoken of staging the game where it might provide “the best competitive advantage”. He added Wales would be willing to leave it to the last minute before announcing the venue as they look to shock Neville’s team and earn a place in history. Wales next play second-place England on August 31 before the Lionesses head out to face bottom side Kazakhstan four days later.